What it’s about: Why, only your sovereign monarch, long may he reign! 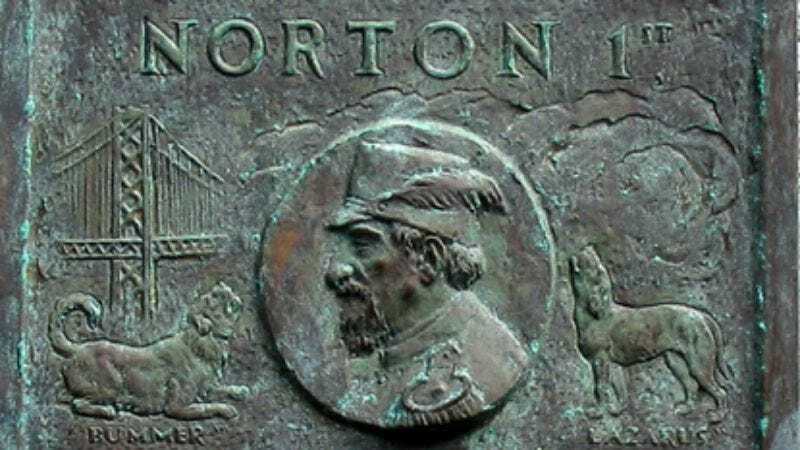 An English-born, South African-reared San Franciscan, Joshua Norton was a failed businessman who declared himself emperor of the United States and protector of Mexico in 1859. Fed up with “what he considered the inadequacies of the legal and political structures of the United States,” he made announcements in several Bay Area newspapers declaring himself emperor. While his authority was never accepted by those usurpers in Washington, D.C., he was embraced by the Bay Area as a beloved eccentric, and either 10,000 or 30,000 people (depending on whether you believe the top of the Wiki page or the middle) attended his royal funeral. Strangest fact: While many of Norton’s royal decrees were delusional, some actually came to pass, although not in his name. He instructed his subjects to form a League Of Nations, 50 years before one was actually formed. He also decreed that the citizens of San Francisco and Oakland raise funds for a bridge or a tunnel connecting the two cities. Both now exist, as the San Francisco-Oakland Bay Bridge officially opened in 1936, and the Transbay Tube was completed in 1969. We learned last week that the fraternal organization E Clampus Vitus adopted Norton as an honorary member; they also created a plaque crediting Norton with the bridge’s conception, although it was never put in place and, after a spell in the Transbay Terminal, is now in storage. Biggest controversy: Norton seems to have gone into politics only after his efforts in the private sector failed. At one point, the future emperor was quite a successful businessman. He used a $40,000 inheritance from his father to make a quarter million in real estate, (over $7 million in 2016 dollars). When a famine in China drove up the cost of rice, Norton saw an opportunity, buying a 200,000-pound shipment of rice from Peru, hoping to corner the market. But more Peruvian rice followed, driving the price back down. That alone wouldn’t have ruined Norton—he had invested 10 percent of his fortune—but he spent years in litigation, claiming the rice he was sold was substandard. Eventually his real estate holdings were seized to pay debts and he filed for bankruptcy. Thing we were happiest to learn: Norton wasted no time in making America great again. Two years after declaring bankruptcy, he crowned himself emperor, stating in his decree his intent to “make such alterations in the existing laws of the Union as may ameliorate the evils under which the country is laboring.” He walked the streets of San Francisco in a blue uniform with gold epaulettes, a peacock feather in his hat, and a cane. He would inspect the condition of the city’s cable cars and the appearance of its policemen. Eventually, he was shown some manner of respect by his neighbors. Restaurants would let him eat for free, accepting the emperor’s self-made currency. When his uniform became tattered, the San Francisco Board Of Supervisors bought him a replacement. Thing we were unhappiest to learn: Very few of Norton’s decrees were actually carried out. He instructed Congress to disband, and when they did not oblige, instructed the Army to forcibly break up Congress, arguing that “it is necessary for the repose of our Empire that the said decree should be strictly complied with.” When the Army didn’t comply with his orders, he tried disbanding both the Democratic and Republican parties, and ordered the Catholic Church and various Protestant sects to ordain him as emperor (his requests were ignored). Also noteworthy: Rumors abounded about the nation’s new monarch during his reign. Some suspected he was the son of Napoleon III, using an assumed name for protection. There were also tales of his impending nuptials to the widowed Queen Victoria, and after his death, numerous letters to the British monarch were found among Norton’s possessions (although nothing indicated he ever received a response). He was also rumored to be fantastically wealthy, affecting poverty because he was a miser. In fact, he was nearly penniless, not counting the currency he invented for his own use. Best link to elsewhere on Wikipedia: Also embracing Emperor Norton is Discordianism, a religion and philosophy that venerates chaos. Named after Discordia (Eris in Greek), goddess of chaos, the faith was founded sometime around 1963, and their complicated dictums make it difficult to tell whether the religion is earnest or satirical. Further down the Wormhole: Many writers have payed homage to the emperor, starting with the phony king and duke in The Adventures Of Huckleberry Finn. Neil Gaiman used Norton in his Sandman comic “Three Septembers And A January.” While Gaiman is agnostic, his parents were Jewish but converted to Scientology and studied Dianetics. Dianetics is the pseudoscience from which Scientology gets its name, based on unverifiable claims like that purging painful memories can cure physical illness. Wikipedia includes it on a list of pseudoscience alongside cryptozoology, the study of animals whose existence is not recognized by the scientific community. Wikipedia, however, recognizes a list of cryptids, which we’ll take a look at next week.